When to repot vegetables into normal earth? A month ago, I sowed some tomatoes, paprika and kohlrabies into nutrient poor sowing earth. They are growing nicely, but I am wondering, when it is time to repot them into normal (nutrient rich, pre-fertilized) earth. Right now, the paprika are about 4 cm/1.6 in tall, carrying massively green leaves. The tomatoes are about 6 cm/2.5 in tall and their leaves got a bit darker in the last days. The kohlrabi is up to 8 cm/3 in tall and looks great with fresh looking green leaves. Is there a rule of thumb for when it is time to repot into fertilized earth, that can be applied to all vegetables? And do I have to add an intermediate step and plant them into a normal/sowing earth mix, before putting them into 100% normal earth? without more specific information its hard to say anything with certainty, but in a greenhouse setting repotting is done when the plant's roots have colonized the available soil. i suppose you can transplant at any point. but you want to wait for the plants to show vigor and do it before they start setting any fruit/product so that the stress doesn't abort your tomatoes before they even have a chance. You don't say what size pots your plants are in currently, but if they are small (9cm or thereabouts) then pot them up now into larger pots using ordinary (not starter) fresh potting soil. If you are intending to keep them in pots ongoing, you will need to pot on again into their final, larger pots as the plants get larger, but you should not use earth from the garden for this purpose, you will need to use more potting soil. Ordinary garden soil in pots is not a good idea, for it may contain pathogens which, whilst fine in open ground, may not be fine for your plants contained in a pot. However, if you eventually want to grow these plants outdoors, it's fine to transplant into the ground when the weather where you are is suitable. It is time to transplant your starts into your prepared garden beds. If you've grown them in pots out of doors from the beginning then go transplant. If you've grown your starts indoors or in a greenhouse there is one more step, make sure you acclimate your starts to the amount of sunlight before planting them out of doors, whether it is outside of a greenhouse or outside your home. Unless you've been growing your starts out of doors already used to the bare sunshine, IR, they need to go through a hardening process. Take them outside (this is where those plant trays come in handy) for 5 minutes day for three days. 10 minutes a day for 3 days. 20 minutes a day for 3 days. 40 minutes per day for 3 days. When your plants can stay outside for 2 hours without burning they are ready to transplant into the garden. I always go for 4 hours because it just takes one sunburn to kill a plant or set it back. I would also purchase some row cloth. This protects the plants by raising the temperature beneath the fabric 10 degrees or more from the ambient temperatures, protects tender leaves from wind storms, hail, strong rain. I've also shortened the acclimation times using row cloth but it is best to be safe than sorry. Kohlrabi is a brassica, a member of the cabbage family. The brassicas have a few problems with insects especially a moth, a butterfly and a fly who lay their eggs under the leaves, in the leaves or in the soil around the base of a brassica. When the egg hatches the larvae eat the leaves or the root crown until they pupate and when an adult they fly away. The row cloth will protect your Kohlrabi from flying adults. Just pin the edges down with soil so that the adults are unable to crawl beneath the row cloth. Keep the cloth over the plants fluffed up, loose. Water the soil well before installing the cloth. Irrigation water, rain water will penetrate the fabric as well as sunlight but also sheds lots of water and some of the IR of the sunlight. Soil is never 'fertile'. Even the soil of ancient forests ESPECIALLY the soil of ecosystems that are untouched by humans, have little chemistry plants need to grow and thrive. There is a reason for that. Ecosystems don't want overpopulation problems. All the important chemistry plants need to make their own food is held in their biomass until a leaf falls or a tree dies that chemistry is not available in the soil. Any garden we humans try to grow is completely artificial. The plants rely on us humans to monitor and add just the right amounts of fertilizer for the plants we want to succeed to succeed. Each species of plant has its own particular chemistry needs with which to make its own food. The only addition you should make to your garden soil is organic matter that is DECOMPOSED. I throw shovelfuls of decomposed organic matter into the soil as I double dig my plant beds the first and only time. Otherwise, I coat the top of my beds with decomposed organic matter, once or twice per year. Forget worrying about weeds. The soil organisms come up and eat this decomposed organic matter, go back into the soil and poop it out feeding even more soil organisms and improving the TILTH. I clean out the 'trenches' at the base of the raised beds with a shovel twice a year throwing the soil on top of the raised bed (see picture). If you use straw, bark, raw manures...you are using non decomposed organic matter that has to first be decomposed before the soil organisms have food to eat for energy. Using non decomposed organic matter causes the soil organisms both macro and micro to go to sleep. Go dormant or die until the decomposing organisms have done their job. These decomposing organisms use nitrogen for energy. Any nitrogen that was part of the straw, bark, woods, newspapers, raw poop, banana peels, egg shells, cardboard, grass clippings...will be used in the work of decomposing. Plants need Nitrogen, Phosphorus, Potassium, in proper percentages for the vegetable you want to grow. These are the macro 'nutrients' that I call macro chemicals. Nutrients makes people think of food and the more the better which is a poor mindset for growing plants. The micro chemistry would include; Boron, Manganese, Magnesium, Iron, Sulfur, Silicon, Calcium, Copper, Zinc...and more. Just needed in trace trace amounts so you need to know what is already in your soil or you'll have problems with excess amounts of chemistry. Less is best. But none is dumb? Never understood that little rhyme that doesn't rhyme, grins. Do not depend on compost for fertilizer. Decomposed compost feeds the soil macro and micro organisms. The soil organisms mix the organic matter into the soil profile FOR you better than you could or should do. You want to be in charge of the chemistry of your soil. When you get more involved with chemistry plants need, you'll be able to incorporate 'signs', 'symptoms' of plants that tell you what chemistry is in excess and chemistry that is deficient. Too little chemistry is better than crossing the line with too much because plants will die quicker with too much than too little. I would get at least one professional soil test and purchase a couple of pH meters so that you can know which beds you will make acidic (potatoes, blueberries) and those that are neutral and more alkaline for most vegetables needs. Make sure you understand the crucial aspect of rotation in your vegetable garden. For instance, brassicas should never be planted where brassicas have been grown within the last 2 seasons. If you grew broccoli last year do not grow any of the cabbage family in that soil for 2 years and that includes Kohlrabi. Tomatoes are the same. Solanaceae. Do not plant tomatoes in soil that has been used for growing tomatoes, peppers, eggplant during the past 2 years. I grow a lot of my Solanaceae in pots with potting soil to extend my garden. It is tough to have the room to rotate species in any garden. Pots with ONLY potting soil help to expand the growing area in your garden. Never use garden soil in pots. 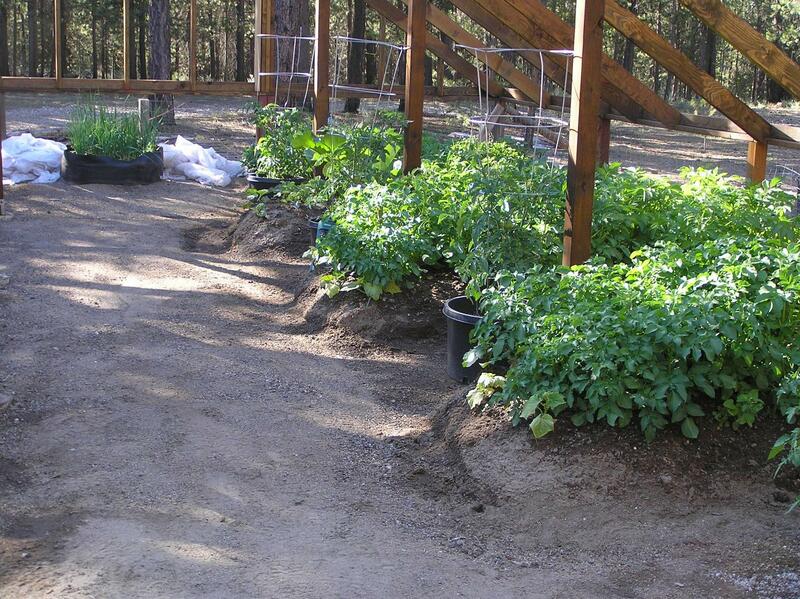 In this picture of my most recent garden (volcanic pumice with minuscule organic matter lodgepole/bitterbrush forest) as we build the greenhouse around the garden...you see lots of potatoes, tomatoes were planted in 5 gallon to 10 gallon pots. Had to acclimate the tomatoes to real sunlight as we went through the up potting process to get to that size of pot. Very different from planting a 4" potted vegetable start into the garden proper. You do not need to get the starts used to the soil of the garden. You do have to acclimate them to the sunlight. When plants are grown indoors or with attenuated sunlight or artificial lights their epidermis is very thin. If you take a plant out of doors that only knew light from the kitchen window sill and put it out in the sun, that plant will get a 'sunburn' within minutes. Some plants are more fragile than others when being taken out of doors or having their environment changed. Acclimation also has to be done going from out of doors to the indoor environment if you want a plant (live xmas tree) to survive, a very similar process in reverse has to be done or one should have just purchased a cut tree. Not the answer you're looking for? Browse other questions tagged vegetables tomatoes repotting or ask your own question. When and how should I transfer propagated cuttings into individual pots? How high to earth fennel? When should I repot my avocados? When should I repot a newly planted potato? Is it time to repot my chili plants? Should I repot my plants that I bought online? When and how to repot this cactus? Should I repot these pineapples?